The Club Crocodile Hotel Resort in Airlie Beach is a multi-award winning tropical resort that offers both families and couples value for money accommodation in the heart of the Queensland Whitsundays. When you choose to stay at this quality Airlie Beach resort your holiday will combine the variety and excitement of mainland Airlie Beach with the wonders of the Great Barrier Reef and the spectacular Whitsunday Islands. Accommodation in this delightful Airlie Beach Whitsundays hotel / resort comprises spacious resort rooms that are ideally set in a beautiful tropical Queensland setting. All of the affordable hotel rooms at the Club Crocodile Hotel are well equipped with all the facilities required to ensure that you have very pleasant and comfortable accommodation in Airlie Beach. 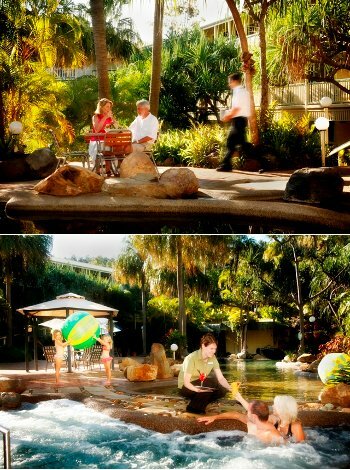 For a holiday, honeymoon, conference or an adventure the Club Crocodile Resort in Airlie Beach has it all. You can explore all of the natural wonders of the surrounding region or simply relax around the resort style pool and ebjoy some of the refreshing drinks and delicious food that it on offer at the hotel. Queen Hotel Room - This affordable hotel room overlooking the oasis style pool and features a comfortable Queen size bed. It also has a private ensuite bathroom, air-conditioning, ceiling fan, balcony, ironing facilities, fridge, tea & coffee making facilities, phone, hair dryer and safety deposit box. Family Hotel Room - This family sized hotel room can sleep up to 4 people on Queen bed and 1 set of single bunk beds. It also has a private balony overlooking the oasis style pool, family sized bathroom, air-conditioning, ceiling fan, ironing facilities, fridge, tea & coffee making facilities, phone, hair dryer and safety deposit box. Deluxe Queen Hotel Suite - This spacious hotel suite has a private balcony that overlooks either the resort swimming pool of the picturesque Coral Sea. It features a Queen size bed, ensuite bathroom with bath, air-conditioning, ceiling fan, Free cable TV, ironing facilities, hair dryer, fridge, phone, safety deposit box and tea & coffee making facilities.